Ayurveda is a combination of complex analytic knowledge and simple practical solutions. It encompasses a deep understanding of the intricacies of our environment, our bodies and the elaborate mechanisms that operate them and at the same time it suggests clear, coherent, intelligent and uncomplicated information and practises for dealing with disharmony in body and mind. Ok this all sounds a bit puffed up! What am I talking about? You’ll hear me talk about balance a lot because that is the real aim of Ayurveda, to support a harmonious way of living and bring balance to our bodies, minds and lifestyles in order to tap into our natural source of energy. Each person is born with a set Prakriti which translates as its ideal configuration and which is a very specific balance of the 5 primary elements. This combination basically shapes your personality & physique. Once you’ve assessed your overall constitution you can look at its principal characteristics to understand what works for you and how to restore balance when you’re in a state of aggravation or dis-ease. If you’re unsure of your personal make-up then please take a moment to take the test I posted with my previous article Know Your A, B, C’s. Today we’ll look at Vata dosha but keep in mind that you could have more than one predominant dosha. I am very much a pitta-vata with very little Kapha in me and as I tend to go “over-board” quickly it is important for me to routinely soothe my vata and cool my pitta. Take the test and check-in with yourself. Vata governs flow and motion in the body. 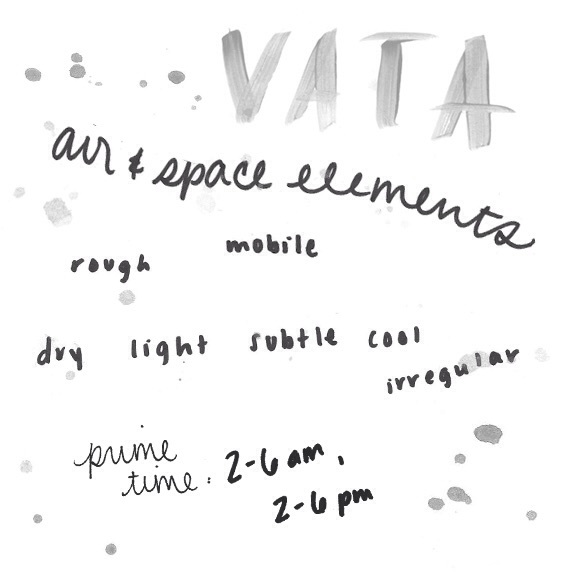 The basic elemental attributes (gunas) of Vata dosha are cold, dry, light, subtle, mobile, irregular, sharp and quick, hard, rough and clear. The physiology of a Vata will tend towards a thin body with a small frame, small eyes, possibly dry skin. You might be a light sleeper, finding it difficult to fall asleep and waking in the night. Your physical activity is variable and can jump from periods of intensity to nothing at all with bursts of high energy then feeling flat. You talk and walk quickly. You are impulsive and emotionally sensitive. You lean towards restlessness when out of synch. Your appetite is irregular as is your digestion, with possible constipation. You feel the cold more sharply and so prefer warmer climates. You hardly sweat and body odour is minimal. Menstruation in women can be irregular. You are more prone to disease, pains and aches as well as mental disorders. You are very alert and a quick thinker, grabbing and understanding information very quickly, forgetting quickly too. You tend to be fearful & anxious when out of balance but you are also a creative and bring freshness and enthusiasm to your many new endeavours. You are motivated, easily excited and vivacious when in balance. The subtle essence of vata is Prana (life energy/breath in Sanskrit). To balance vata when it has gone in overdrive there are a number of options. Eat a vata-pacifying diet. Ayurveda recommends including all 6 tastes with each meal but Vatas should favour salty, sour and sweet tastes above all. It is best for you to have a warm meal, using oils. Winter one-pot meals are very good and grounding as are porridge or other hot cereal breakfast types. Spices are helpful because heating, and a little fresh ginger in a hot drink taken sometime before a meal will warm up your digestive system. Don’t forget to drink lots of warm liquids throughout the day. Try warm milk with cinnamon or nutmeg 20 minutes before bed to sleep and as a Vata you’re actually allowed to snack inbetween meals if you feel a bit light-headed, a piece of fruit would be the ticket. Ayurveda has a depth of research about what foods are appropriate to eat for each dosha. This knowledge is based on the potent energy (virya) of the food and its post-digestive effect. See “Eat Taste Heal, An Ayurvedic Cookbook For Modern Living” in my Resources page for now. Perhaps the last thing you want to hear with your adventurous nature is that you really must bring in regular eating and sleeping habits. Have your meals at the same time every day, go to bed at the same time. Exercise at the same time even. Boring I’ll hear you say but there is truly no better advice for soothing the nerves and accessing your innate resources of energy. Avoid loud noises and crowds. Your packed commuter train is not your friend, any chance you can cycle in? Also try and get a rain-check on some of your evening commitments and get a proper night-in time-out to rest from your busyness and overstimulation if you sense that you’ve become all-a-frazzled. Get some rest and avoid stimulants. Pick up a good book instead. Tip of all tips for Vatas, give yourself a daily warm sesame oil massage at the beginning of the day. Check my post Self-Love In The Shower for a full how-to. According to Ayurveda spending time in nature helps heal our body and mind and of the many outdoor sensory experiences that promote wellbeing walking barefoot on the earth or grass for a few minutes every day is probably the best practice for grounding the turbulence of a vata racing mind. Put your attention on your feet, feel the earth’ solid support and imagine taking roots & absorbing nourishment from the ground up. Also spend a little time in the sun to balance the cold nature of vata. If you feel sick, sit by a window and allow the light and warmth to seep in. Avoid drafts, put a layer on and as vata is also dry make sure that the air in your room is humid enough. If not get a houseplant or place a metal bowl full of water on a heat source. Finally as Vatas spend a lot of time in their heads try and focus on your body more with a good yoga session but go for a gentle slow moving class, Yin yoga is a good example. Or do Tai Chi. Good luck with these, and if in doubt keep in mind one of the tenet of Ayurveda which is “Like increases like” and take steps to “use opposites as medicine”.